The Virginia Creeper vertical green wall is located on the North and West facades, which provides wonderful shade and protection from the summer heat, and being deciduous, allows the winter sunshine to penetrate through for winter heat. The vertical green wall had to be professionally engineered and approved by the local Council, and was designed for to be completed in two stages. First at a height of 4.5 metres (which is indeed it's present height), and with an intended extension bringing it up to 6.0 metres in height. Notably, the structure was in fact engineered and approved for the complete 6.0 metre height. 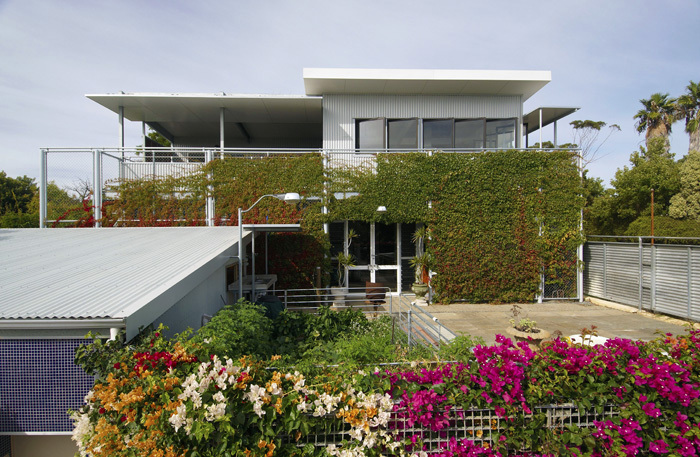 The vertical green wall currently stands at a height of 4.5 metres on both sides of the property of Garage Mahal Home in Lois Lane near Fremantle, and covers 126 square metres. It is the largest green wall in Western Australia at present, and quite possibly the largest domestic green wall in Australia. An artist's impression of the vertical green wall at full 6 metre height with engineering and council approvals. Vertical greens walls are designed to be integrated to the design of the building, adding purpose to it's function and climate performance. 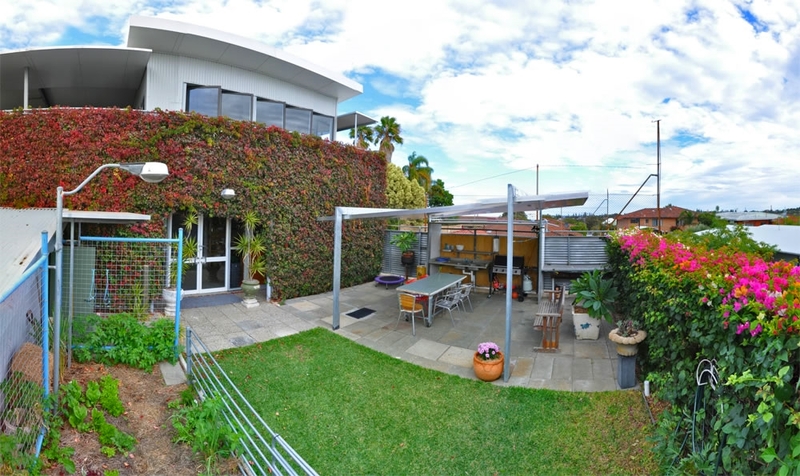 Garage Mahal Home has a large northerly facing wall, with a 1.0 metre wide breeze-way between the building itself and the green wall, which creates a natural climate shield, cooling and preserving warmth to the building respectively. It was constructed with a heavy duty steel frame, which was laced with a high gauge galvanised steel cyclone mesh. 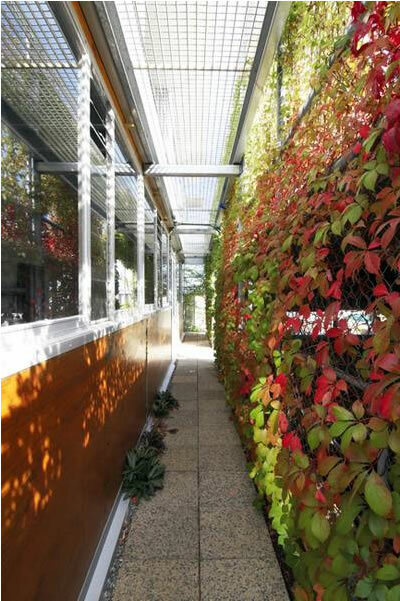 The performance of the deciduous vegetation was critical, in that it had to be fast growing with minimal maintenance, and ideally providing complete shade in summer for cooling the building, and becoming bare in winter for thermal heating. "Virginia Creeper (parthenocissus quinquefolia) loves the sun, part shade, is hardy to frost, and grows to a height of 15 metres. It is a tough deciduous climber which has brilliant red autumn toning, and blackberries are also produced in the autumn. A great climber for exposed (or unsightly) walls, and since it is a self-clinging climber there is not need for support. It is able to grow quick in height if required." The Virginia Creeper is planted across the length of the facade, at a distance of 1.5 meters apart, beneath the cyclone fence wall structure. Watering is handled by a subterranean drainage system, which extracts grey water from all outlets on the property. There are also surface drain uprights which feed to the underground drainage system, for additional watering during extreme heat. * For more information on Vertical Green Wall design and practice see the visit the website of Patrick Blanc.